Renowned for its playful patterns, vibrant colours and elegant draping, Issa is synonymous with superbly feminine design. First shown at London Fashion Week in 2006, the brand is now headed by creative director Jamie O'Hare. 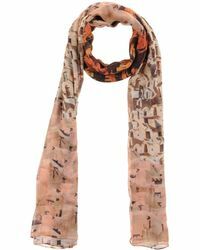 Issa scarves provide a stylish finish to year-round wardrobes. Made from lightweight premium fabrics, each floaty scarf is refreshed by eccentric colourways and graphic prints for a statement, irreverent finish. Wear yours casual draped over the shoulders or wrapped around your head in homage to the silver screen icons of the past.